Last year, Silver Birch Press published my poem “Eastern Standard” as part of their “Me, during the Holidays” series. https://silverbirchpress.wordpress.com/2015/12/31/eastern-standard-poem-by-joanne-corey-me-during-the-holidays-poetry-and-prose-series/ . I am pleased to share the poem here today. Wishing everyone a new year filled with peace and joy! I posted about our Christmas Eve and Day, but haven’t filled in much of the rest of our Christmas observance. We do try as much as possible to observe Advent as a time of waiting and preparation, even though culturally in the US, most of December is packed with Christmas festivities which end on Christmas Day rather than begin there. One of the things that helps us extend our celebration of Christmas is the arrival of my sisters and their families after Christmas. This year, they arrived on Dec. 26. We met at my parents’ apartment for food, fun, Christmas cookies, and gift exchange that afternoon and evening, followed by a big dinner at our house on the 27th. We inherited the making of family dinners when my parents first moved to an apartment about ten years ago. Part of the inheritance came in the form of the electric rotisserie that I remember from my childhood, on which we made a traditional rolled beef rib roast. We served mashed potatoes, gravy, popovers, rutabaga which my parents prepared, baked onions, Aussie-style bread which our son-in-law made, and fall vegetable chili, which is made with carrots, parsnips, sweet potato, onion, tomato, and red and white kidney beans. For dessert, we had four pies: apple, pumpkin, apple blackberry, and cranberry meringue, an addition to our pie repertoire made by our older daughter and her husband. Four pies may seem like a lot for fourteen people, but we always want to have some left over for breakfast the next morning! Unfortunately, work schedules and threatening weather intervened and both sisters and family had to return home on the 28th. That left us two days with our older daughter E and son-in-law L before they had to fly home to Honolulu. We went out to lunch at a couple of our favorite local eateries, spent time with the grandparents, and enjoyed quiet times at home. On the morning of the 29th, we were all up at 4 AM to get ready to bring E and L to the airport for a 6 AM flight to Newark and then on to Honolulu. We wished they could have stayed longer, but were very grateful to have them with us for a week. I did write about our (sedate) New Year’s Eve and Day, although I did have the excitement of a new poem coming out on Silver Birch Press. Epiphany is traditionally the day that we take down our Christmas tree, although we were late putting it up this year and it isn’t dropping needles, so maybe we will wait until next weekend. B returns to work on Monday and next week’s calendar is filled with appointments, so it is back to reality, or at least what passes for routine, tomorrow. Happy New Year, everyone! We began our celebration toasting at midnight GMT, also known as 7:00 PM Eastern Standard Time, as I write about in my new poem on Silver Birch Press. We drank the very bottle of sparkling apple cranberry juice that I used in the photo, along with the wine glasses pictured. I did use some poetic license in the poem, as we do still have daughter T here celebrating with us this year. I woke up early this morning with part of the middle of a poem for the collection I am working on this year swirling about in my head, so I got up to type it into google docs before I lost it. I’m hoping it is a good omen for my poetic work this year to start January first by drafting new work for my first ever collection. Later this morning, we will head up to GSV, the senior community where our elder generation live, to pick up Nana for 10 AM Mass. January 1st is a holy day in the Catholic Church, dedicated to Mary, the Mother of God. After church, we will have brunch at GSV with Nana, Paco, Grandma, and Grandma’s neighbor Ann. There aren’t plans for the rest of the day, although I expect it will be low-key. As you can see, we are not the wild and crazy types! I wish everyone the gifts of peace, joy, and contentment in 2016! 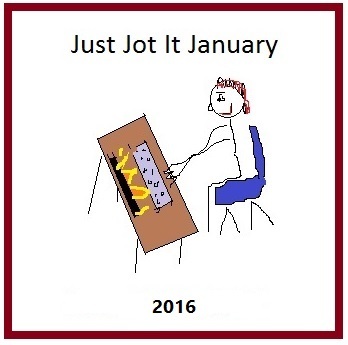 Author Joanne CoreyPosted on January 1, 2016 Categories blogging/writing, current events, family, Just Jot It January, poetry, religious/spiritualTags 2016, JusJoJan, New Year, New Year's Eve, poem, SIlver Birch Press18 Comments on Welcome, 2016! I am pleased to announce that my New Year’s Eve poem “Eastern Standard” is part of the “Me, During the Holidays” series on Silver Birch Press. Best wishes to everyone for a wonderful 2016! It will run on New Year’s Eve, so watch this space for the link!